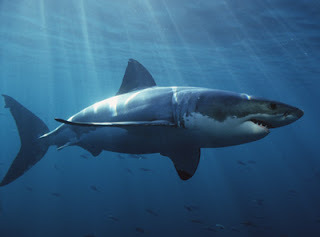 According to the Associated Press, "the National Park Service is warning surfers, snorkelers and swimmers that it's the great white shark birthing season off the California coast and the creatures are making their presence known as they attack seals. Sea lions were recently attacked by great whites on three occasions off Santa Barbara Island, a popular snorkeling area about 40 miles south of Ventura. A weekend great white off Santa Barbara's East Beach led officials to keep youngsters in the Junior Lifeguard program on the beach Monday and Tuesday. On Sunday, a great white pup was found dead at Rincon Beach. Marine Conservation Science Institute president Michael Domeier says pregnant females give birth this time of year in shallow California waters."